George Osborne’s Swiss tax deal is allowing these individuals to buy their anonymity - but the question remains, why would they want to be anonymous? The answer may be because Brown wanted an international deal that would work for all countries, including the UK, and would not stab poorer states in the back. Christian Aid view the bargain as essentially a betrayal of the developing work, arguing it ‘amounts to collusion with criminality’. Presently, UK residents can hold anonymous accounts in Switzerland to avoid paying tax. The deal gives these account-holders a choice – either reveal your account and how much is held in it, or the Swiss authorities will tax the account at 19 to 34 per cent, and pass on the proceeds to the UK. 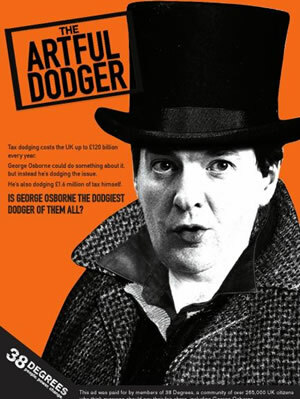 Essentially George Osborne is allowing these individuals to buy their anonymity. But the question remains, why would they want to be anonymous? “This deal makes it much less likely that developing countries will ever be able to get the taxes owed to them from those hiding money in tax havens like Switzerland. It is a disgrace. “Why would anyone rather pay a back tax of 19 to 34 per cent on the money they have hidden in Switzerland than reveal their identity, unless they have done something seriously wrong? And why is the Government letting them get away so lightly? Campaigners had hoped for a comprehensive tackling of tax avoidance to be on the agenda for the G20 meeting in November, when governments could have set up an information exchange system between themselves to track down avoiders. This unilateral action by the UK government, and such alleged action by Germany, essentially sells smaller countries without the same clout down the river. “It’s important to say this deal was not needed. The revised European Union Savings Tax Directive is on the table. Twenty five EU states support it and it has looked very likely recently that compromise with the other two was possible and that Switzerland could have been pulled on board. “That deal would have ensured we’d have got all the information we needed to demand all the tax due by those who have been criminally evading their tax bills by hiding funds in Swiss banks that have been deliberately and knowingly helping them to do so. “Under this deal, the tax withholding rate to be applied to UK taxpayers holding bank accounts in Switzerland – who do not want details of their affairs disclosed in the UK – will deliberately be less than their UK marginal tax rate. “The UK government has just handed a perpetual competitive advantage to Swiss banks over UK banks in the markets for savings in the UK. And think just how stupid that is. After all – isn’t every financial adviser now going to be duty bound to tell poeple they can save tax by putting their money in Switzerland?